Human CD34+ hematopoietic precursor cells cultured on delta-like ligand 1 expressing OP9 (OP9-DL1) stromal cells differentiate to T lineage cells. The nature of the T cells generated in these cultures has not been studied in detail. Since these cultures do not contain thymic epithelial cells which are the main cell type mediating positive selection in vivo, generation of conventional helper CD4+ and cytotoxic CD8+ TCRαβ cells is not expected. Phenotypically mature CD27+CD1− TCRγδ as well as TCRαβ cells were generated in OP9-DL1 cultures. CD8 and few mature CD4 single-positive TCRαβ cells were observed. Mature CD8 single-positive cells consisted of two subpopulations: one expressing mainly CD8αβ and one expressing CD8αα dimers. TCRαβ CD8αα and TCRγδ cells both expressed the IL2Rβ receptor constitutively and proliferated on IL-15, a characteristic of unconventional T cells. CD8αβ+ and CD4+ TCRαβ cells were unresponsive to IL-15, but could be expanded upon TCR stimulation as mature CD8αβ+ and CD4+ T cells. These T cells had the characteristics of conventional T cells: CD4+ cells expressed ThPOK, CD40L, and high levels of IL-2 and IL-4; CD8+ cells expressed Eomes, Runx3, and high levels of granzyme, perforin, and IFN-γ. Induction of murine or human MHC class I expression on OP9-DL1 cells had no influence on the differentiation of mature CD8+ cells. Similarly, the presence of dendritic cells was not required for the generation of mature CD4+ or CD8+ T cells. These data suggest that positive selection of these cells is induced by interaction between T precursor cells. Hematopoietic precursor cells (HPC)3 differentiate to T cells in the thymus (1, 2). If both the TCRγ and TCRδ are successfully rearranged first, cells become immature CD27−CD1+TCRγδ+ and finally mature double-negative (DN) or CD8 single-positive (SP) CD27+CD1− cells (3). If, on the other hand, TCRβ is rearranged first, the TCRβ chain associates with the pTα chain to generate double-positive (DP) cells, which after TCRα rearrangement mature to TCRαβ+ cells. The latter differentiation pathway is dependent on the presence of MHC class I and II Ags on thymic epithelial cells (TEC) for positive selection leading to mature CD8+ cytotoxic cells or CD4+ helper T cells, respectively (4). This maturation process is thought to be different from the maturation of TCRγδ+ cells that differentiate to mature cells after high-affinity engagement of the TCR with a self-ligand present in the thymus, without involvement of MHC molecules on TEC (5). Within the TCRαβ population, a number of small subpopulations, called “unconventional” cells, such as NKT cells, CD8αα intraepithelial lymphocytes (IEL), and mucosal-associated invariant T (MAIT) cells were described which differ from conventional CD4+ and CD8+ TCRαβ cells (6, 7, 8, 9). Some of these cells such as MAIT and IEL recognize autoantigens or use nonclassical MHC molecules as restricting element. Similarly, NKT cells were described to be selected by high-affinity interactions on hematopoietic cells and acquire IL-2Rβ (CD122) similar to TCRγδ cells. In addition to these naturally occurring unconventional cell populations, populations with similar characteristics were described in genetically engineered mice. Mice in which only hematopoietic cells and not TEC express MHC class II Ags generate CD4 SP TCRαβ cells that are selected via a different mechanism than CD4 TCRαβ selected on TEC (10, 11). Both pathways result in CD4 SP TCRαβ cells, but the cells selected on hematopoietic cells express IL-2Rβ and have a cytokine secretion pattern similar to NKT cells, whereas those selected on TEC do not (11). Although the precise mechanisms leading to positive selection and terminal maturation are unclear, the evidence above suggests that TEC as well as hematopoietic cells can both mediate selection but do so via different mechanisms and generate functionally different cells. When murine HPC are cultured on OP9 cells transduced with delta-like ligand 1 (OP9-DL1) in the presence of IL-7 and Flt3L, these cells were reported to differentiate into DP cells and finally into CD3+ cells that are able to produce IFN-γ (12). We and others described that mitogen-responsive TCRαβ cells could also be generated starting from various sources of human hematopoietic precursors in OP9-DL1 cultures (13, 14). However, in none of these reports was the nature of the mature T cells analyzed in depth. Recently, two groups have shown that precursor cells transduced at the same time with TCRα and β encoding viral constructs differentiate in such cultures to mature TCRαβ cells, which are cytotoxic and produce cytokines such as IFN-γ or GM-CSF (15, 16). These cells were cytotoxic CD8+ T cells with the same specificity and restriction as the original receptor and no CD4+ mature T cells were generated. However, it is unclear whether development of such double-transduced precursor cells follows physiological pathways of TCRαβ differentiation or rather, as described in TCRαβ double-transgenic mice, differentiate along a TCRγδ-like pathway without the need for MHC-driven positive selection (17). The available data suggest that OP9-DL1 cultures support positive selection on MHC class I Ags present in the culture, leading to CD8 SP mature cells. Although the above hypothesis is an attractive one, especially in view of the usage of such a system for clinical application, at this moment there is insufficient evidence that the cells generated are conventional positively selected T cells. We therefore studied in more detail the nature of the mature T cells generated in such cultures and the relationship with MHC expression on the different cell types. Human CD34+ HPC were isolated from postnatal thymus (PNT) or cord blood. Human CD4 immature SP (CD4ISP) cells were isolated from PNT. Cord blood and PNT (children between 0 and 12 years of age) were obtained and used following the guidelines of the Medical Ethical Commission of the Ghent University Hospital (Belgium) which approved this study. Informed consent was obtained in accordance with the Declaration of Helsinki. Mononuclear cells were obtained by density gradient centrifugation (Lymphoprep; Nycomed Pharma). CD34+ HPC were enriched by anti-CD34 MACS (Miltenyi Biotec) to achieve >97% purity. Contaminating T cells were measured at the start of the culture: CD3+TCRαβ+ counted for <0.1% of total live cells. For cord blood, purified CD34+ HPC were labeled with CD38-PE and CD34-allophycocyanin and sorted with a FACSVantage cell sorter (BD Biosciences) for CD34+CD38− HPC to a purity of >99% and no detectable contaminating CD3+TCRαβ+. Mature CD1− CD3+ cells were undetectable by FACS analysis on days 5 and 10 after the initiation of OP9-DL1 cocultures, which indicates that small numbers of contaminating mature cells do not expand under these culture conditions. CD4ISP cells were enriched using sheep anti-mouse IgG Dynabead (Invitrogen) depletion of PNT cells labeled with CD3 and CD8 murine mAb, followed by sorting of the depleted cell fraction for CD34−CD4+CD1+HLA-DR− cells, using a FACSAria II cell sorter (BD Biosciences), to a purity of >99%. At different time points of coculture, subpopulations were sorted using a FACSVantage or a FACSAria II cell sorter. Sorted cells were >99% pure as determined by post sort analysis. OP9-DL1 cells were obtained from Dr. J. C. Zuniga Pflucker (University of Toronto, Toronto, Canada). Human HLA-A1, HLA-A2, and β2-microglobulin constructs were a gift from Dr. P. Coulie (UCL, Brussels, Belgium). HLA-A1 and HLA-A2 sequences were cloned into LZRS retroviral plasmids that use cytoplasmic-deleted nerve growth factor receptor as a marker. The β2-microglobulin sequence was cloned into a pMXs retroviral plasmid (puromycin selection marker). Retroviral supernatant was produced using the transfected Phoenix-A-based amphotrofic packaging cell line (a gift from Dr. P Achacoso and Dr. G. P. Nolan, Stanford University School of Medicine, Stanford, CA). A total of 15 × 103 OP9-DL1 cells was seeded on Retronectin (Takara Shuzo)-coated 24-well culture plates (BD Biosciences) in the presence of viral supernatant. nerve growth factor receptor-positive cells were purified by MACS enrichment and subsequently cells were further enriched for β2-microglobulin-transduced cells by adding 2 μg/ml puromycin (Sigma-Aldrich) to the culture medium. Culture medium consisted of α-MEM medium supplemented with 20% FCS, 100 IU/ml streptomycin, penicillin, and l-glutamine (all products from Life Technologies). Cells were cultured with or without the addition of 30 IU/ml mouse IFN-γ (R&D Systems). CD34-enriched HPC or CD4ISP cells were seeded at 2 × 105 cells/well into 12-well tissue culture plates (BD Biosciences) containing a subconfluent monolayer of OP9-DL1 cells. If cultures were started from mixtures of CD4ISP and CD34-enriched HPC, 2 × 105 CD4ISP cells and 1 × 105 CD34-enriched HPC were seeded per well. All cocultures were performed in culture medium consisting of α-MEM (Life Technologies) supplemented with 20% FCS (Life Technologies), 100 IU/ml streptomycin, penicillin, and l-glutamine in the presence of 5 ng/ml IL-7 (R&D Systems), 5 ng/ml Flt3L (R&D Systems), and 2,5 ng/ml stem cell factor (Amgen). Where mentioned, IL-2 (Roche), IL-4 (R&D Systems), IL-9 (gift from Dr. Van Snick, UCL, Brussels, Belgium), IL-15 (PeproTech), or IL-21 (R&D Systems) was added. Every 4–5 days, cells were harvested by forceful pipetting and transferred to a fresh confluent monolayer of OP9-DL1 cells. The following mAbs were used: FITC-conjugated CD3, CD7, CD8α, CD69, TCRγδ, IFN-γ, and HLA-A2; PE-conjugated CD8β, CD25, CD38, CD40L (CD154), IL-4, and TCRγδ; allophycocyanin-conjugated CD8α, CD8β, CD34, and IL-2; PE-Cy7-conjugated IFN-γ; allophycocyanin-Cy7- conjugated CD8α, and HLA-DR (all from BD Biosciences); PE- conjugated NKG2D and TCRαβ; allophycocyanin-conjugated TCRαβ (all from Miltenyi Biotec); PE-conjugated CD1, CD7, and Vα24 (all from Beckman Coulter); PE-Cy7-conjugated CD3, and CD4; and allophycocyanin-Cy7-conjugated CD3, CD4, CD27, and HLA-DR (all from eBioscience). Nonlabeled murine β2-microglobulin Ab (BD Biosciences) was used and visualized with anti-mouse Fab-PE (Jackson ImmunoResearch Laboratories). Abs specific for murine class I H-2k (HB50; American Type Culture Collection), human HLA class I (W6/32; American Type Culture Collection), CD1 (OKT6; American Type Culture Collection), CD3 (OKT3; American Type Culture Collection), CD8 (OKT8; American Type Culture Collection), CD27 (2E4, generous gift from Dr. R. van Lier, CLB, Amsterdam, The Netherlands), and CD45RA (American Type Culture Collection) were purified from culture supernatant and biotin labeled. Biotin-labeled Abs were fluorescently labeled using streptavidin-PE (BD Biosciences) or streptavidin-PE-Cy5.5 (eBioscience). PE-conjugated α-galactosidase ceramide (αGalCer) CD1d tetramer was a gift from Dr. D. Elewaut (University of Ghent, Ghent, Belgium). Cells were labeled in PBS (Lonza) supplemented with 0.5% BSA (Roche) by adding the amount of labeled Abs recommended by the supplier. Intracellular staining for cytokines IFN-γ, IL-2, and IL-4 was performed after initial cell surface stainings using Cytofix/Cytoperm reagents (BD Biosciences) according to the instructions of the supplier. Flow cytometric analysis was performed using a FACSCalibur (BD Biosciences) for four-color analysis or an LSR II cytometer (BD Biosciences) for seven-color analysis. Viable human cells were gated based on forward and side scatter and, except for intracellular stainings, lack of propidium iodide (Molecular Probes) uptake. Cells were harvested from OP9-DL1 cocultures and were either directly transferred to a feeder cell mixture or were first sorted for subpopulations. Between 102 and 105 cells were transferred to a 24-well tissue culture well (BD Biosciences) containing 1 ml of feeder cell mixture. The feeder cell mixture consisted of 105/ml 50-Gy irradiated JY cells (American Type Culture Collection) and 106/ml 40-Gy irradiated PBMC. Medium used was IMDM supplemented with 10% FCS, 100 IU/ml streptomycin, penicillin, and l-glutamine (all products from Life Technologies) in the presence of 1 μg/ml PHA (Sigma-Aldrich). IL-2 (50 IU/ml) was added 4 days after the initiation of the cultures. Cells were restimulated every 10–14 days. Two types of stimulation were used: in a first type, cells were brought to a concentration of 106/ml in a 24-well tissue culture well. PMA (Sigma-Aldrich) and ionomycin (Sigma-Aldrich) were added to a final concentration of 15 ng/ml and 1,5 μg/ml, respectively. After 6 h of stimulation, GolgiPlug (BD Biosciences) was added and an additional 12 h later, cells were harvested and analyzed. For the second type of stimulation, 24-well tissue culture plates were coated with 10 μg/ml CD3 Ab (OKT3; American Type Culture Collection) in PBS. Cells were brought to a concentration of 106/ml in a coated 24-well tissue culture well. CD28 Ab (BD Biosciences) and CD49d Ab (BD Biosciences) were added to a final concentration of 2 μg/ml each. After 1.5 h, GolgiPlug (BD Biosciences) was added to the wells that were used for intracellular staining and an additional 6.5 h later, cells were harvested for analysis. Medium used for both types of stimulation was IMDM supplemented with 10% FCS, 100 IU/ml streptomycin, penicillin, and l-glutamine. RT-PCR was derived from sorted fractions of T cells harvested from OP9-DL1 cocultures. Total RNA was extracted, purified, and DNase I-treated (Qiagen) according to the manufacturer’s instructions. cDNA was synthesized using SuperScript RT II (Invitrogen). Real-time PCR was performed using a qPCR Core Kit for SYBR Green I (Eurogentec) on an Applied Biosystems PRISM 7300 Real-time PCR System. Primers (Operon) were designed using Primer Express 2.0 software (Applied Biosystems). The following primers were used: CD122 (IL-2Rβ) forward (fw), 5′-AGACCCCTCGAAGTTCTTTTCC-3′ and CD122 (IL-2Rβ) reverse (rev), 5′-CAGGGCTGAAGGACGATGAG-3′ (18); ThPOK fw, 5′-TTGAATTTGCCTATACAGCCACA-3′, ThPOK rev, 5′-CACTGCCCTGCAGAATCTCC-3′; CD40L fw, 5′-TTCATGAAAACGATACAGAGATGCA-3′ and CD40L rev, 5′-GCATTTCAAAGCTGTTTTCTTTCTT-3′; Eomes fw, 5′-AGCCCTCAAAGACCCAGACTT-3′ and Eomes rev, 5′-CCAGGGACAATCTGATGGGAT-3′; Runx3 fw, 5′-GGTGGCCAGGTTCAACGA-3′ and Runx3 rev, 5′-TGATGGTCAGGGTGAAACTCTTC-3′ (19); granzyme K fw, 5′-TTACTGTCCTAAGTCGAAAACTTTGC-3′ and granzyme K rev, 5′-TGTGGCAACACCACATTCATG-3′; perforin fw, 5′-ACCAGCAATGTGCATGTGTCTG-3′ and perforin rev, 5′-GGCCCTCTTGAAGTCAGGGT-3′; and GAPDH fw, 5′-TGCACCACCAACTGCTTAGC-3′ and GAPDH rev, 5′-GGCATGGACTGTGGTCATGAG-3′ (20). For these experiments, expression was normalized to GAPDH expression and shown relative to mean transcript levels of CD8αβ+ cells isolated from OP9-DL1 cocultures. Human CD34+ HPC were seeded on the OP9-DL1 feeder layer and terminal T cell differentiation was studied using CD69, CD27, CD1, and CD45RA as markers for postselection cells (21, 22). CD69, the earliest marker of positive-selected cells, was up-regulated on the more mature stages of CD3+TCRαβ and TCRγδ cells, but because of dim expression this marker could not be used for discrimination between immature and positive-selected populations (supplemental Fig. S1).4 Phenotypically mature CD1−CD27+ T cells, on the other hand, could be readily discerned in cultures initiated with HPC from PNT as well as cord blood (Fig. 1⇓ and supplemental Fig. S2). Cultures initiated with HPC from PNT showed the fastest kinetics in the generation of mature cells as shown in Fig. 1⇓A. For this reason, all of the experiments reported below were performed using PNT-derived CD34+ cells. In Fig. 1⇓B, expression of CD27 and CD1 is shown. The more mature stages of T cell differentiation, CD27+CD1+ and CD27+CD1− cells, are present in TCRγδ and TCRαβ lineage cells, suggesting that both lineages mature to functional cells. It can be observed in Fig. 1⇓A that immature CD27−TCRγδ+ start to decrease in absolute number around day 23 of culture and are gradually replaced by mature CD27+ cells to a maximum around day 28. Thereafter, mature TCRγδ+ cells decrease in cell number although they continue to increase in relative numbers (Fig. 1⇓B). Maturation kinetics of TCRαβ cells are slower. Immature CD27− cells peak at day 28, and mature CD27+ cells are generated slowly and much less efficiently than CD27+TCRγδ+ cells and are maximal in absolute cell number between days 32 and 37. We subsequently measured the expression of CD45RA, which is a marker expressed on the majority of T cells exiting the thymus (21). As can be seen in Fig. 1⇓C, CD45RA is expressed on about one-half of CD1−TCRγδ+ cells but is virtually absent from CD1−TCRαβ+ cells, even when analyzed up to 45 days after the initiation of these cultures. This may either indicate that the TCRαβ+ cells have an activated phenotype or that differentiation is incomplete. NKG2D, which is expressed on human activated and resting fully mature CD1− TCRγδ and CD8 T cells (23), was also expressed only on TCRγδ and not TCRαβ cells, suggesting a late defect in differentiation of TCRαβ+ cells generated in OP9-DL1 cocultures. Expression and kinetics of membrane maturity markers on TCRαβ and TCRγδ cells. PNT CD34+ HPC were cocultured with OP9-DL1 cells in the presence of stem cell factor, Flt3L, and IL-7. Every 4–5 days cells were harvested and analyzed for the expression of CD3, TCRαβ, TCRγδ, CD1, CD27, CD45 RA. and NKG2D. A, Kinetics of the absolute numbers of CD27+ and CD27− cells within the CD3+TCRγδ+ and the CD3+TCRαβ+ population. Results shown are mean ± SD of duplicate simultaneous cultures that are representative of seven independent experiments. B, Dot plot of CD1 and CD27 expression in OP9-DL1 cultures between days 23 and 37 within the CD3+TCRγδ+ and the CD3+TCRαβ+ populations. Numbers in quadrants indicate the percentage of the corresponding population. Results shown are representative of seven independent experiments. C, Expression of CD45RA and NKG2D within the CD3+TCRγδ+CD1− and the CD3+TCRαβ+CD1− cell populations on day 37 of coculture. Numbers indicate percentage of labeled cells within the indicated population. Results are from one representative experiment of seven. We subsequently investigated whether CD4-CD8 expression was consistent with the maturation markers expressed on TCRαβ and TCRγδ cells. In Fig. 2⇓A, a representative OP9- DL1 coculture is shown on day 28 which contained CD27− and CD27+ TCRγδ cells. Immature CD27− TCRγδ cells are to a large degree DP and some cells are DN or CD4 SP, whereas mature cells are mainly DN and CD8 SP. CD8 SP cells express predominantly CD8αα homodimers, although few cells express significant levels of CD8αβ heterodimers. These phenotypes are similar to the immature and mature phenotype of TCRγδ cells described in the human thymus (3). 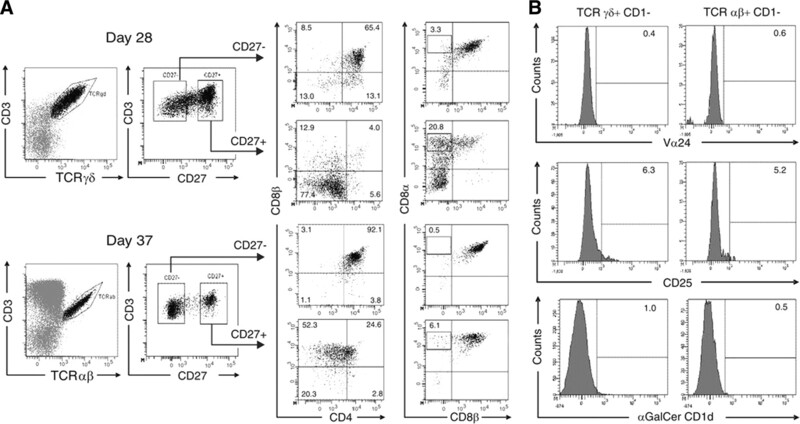 Immature CD27− TCRαβ cells are virtually all CD4/CD8 DP cells. The majority of mature CD27+ cells were CD8 SP. Few mature CD4 SP cells were observed. Since these mature CD1− cells were consistently Vα24− and αGalCer CD1d-tetramer− and few CD25+ cells were detected, which were dim in expression (Fig. 2⇓B), we have no evidence that the majority of the cells represent an outgrowth of T regulatory cells or NKT cells. Mature CD8+ cells were further analyzed for CD8α-CD8β coexpression: CD8αβ coexpression is specific for conventional unstimulated CD8 T cells, whereas TCRγδ cells, activated CD4 T cells, and NK cells express CD8αα homodimers (24, 25, 26). Most CD8+TCRαβ+ cells coexpressed CD8α and CD8β. However when expression of the CD8αβ heterodimers was compared with DP cells, CD8 cells were detected that expressed variable amounts of CD8αα homodimers and some cells expressed CD8αα homodimers exclusively (Fig. 2⇓A). This CD8αα TCRαβ phenotype is hardly detectable in human thymus. Expression of CD4 and CD8 on TCRγδ and TCRαβ cells. PNT CD34+ HPC cocultured with OP9-DL1 cells, in the presence of stem cell factor, Flt3L, and IL-7. A, On day 28 for TCRγδ+ cells and day 37 for TCRαβ+ cells, both CD27+ and CD27− subpopulations were analyzed for the expression of CD4, CD8α, and CD8β. In the CD8β vs CD4 plots, the percentage of cells in each quadrant is indicated. In the CD8α vs CD8β plots, the percentage of cells that is included in the gate is indicated. B, Mature TCRγδ+CD1− and TCRαβ+CD1− cells were analyzed for the expression of Vα24, CD25, and αGalCer CD1d tetramer binding. Numbers indicate percentages of labeled cells within the indicated populations. Cutoff was set based on isotype control Ab from the same company. Results are from one representative experiment of seven. We have shown that phenotypically mature SP TCRαβ+ cells are generated in OP9-DL1 cocultures. This finding suggests that positive selection on MHC occurs in these cultures. Next, we investigated whether MHC expression on OP9-DL1 cells may be causing positive selection of TCRαβ+ cells. We were unable to demonstrate murine class I expression on our cultured OP9-DL1 cells by flow cytometry (Fig. 3⇓A). A staining for murine β2-microglobulin was also negative (supplemental Fig. S3), suggesting that classical (MHC class Ia) and most nonclassical (MHC class Ib) MHC class I molecules were not expressed on the OP9-DL1 cell line (27). When murine IFN-γ was added to OP9-DL1 cultures, murine MHC class Ia and murine β2-microglobulin were expressed on OP9-DL1 cells (Fig. 3⇓A and supplemental Fig. S3) (28, 29). However, no significant effect was seen on the generation of postselection TCRαβ+CD27+ or CD8 SP cells (Fig. 3⇓E). Next, we investigated whether the expression of human MHC on OP9-DL1 could enhance generation of postselection mature T cells. OP9-DL1 cells expressing human HLA-A1 or HLA-A2 (Fig. 3⇓, C–E) were incubated with PNT CD34+ cells and the percentages of TCRαβ+CD27+ and CD8 SP cells were measured. These experiments were performed with and without the addition of murine IFN-γ, since we noted that IFN-γ increased expression of murine as well as human MHC Ags significantly (Fig. 3⇓, A–D). In addition, since it has been reported that murine IFN-γ is species specific, no direct effect on human cells is expected (30). Cultures with HLA-A1+ and HLA-A2+ OP9-DL1 consistently did not generate more mature T cells than cultures with nontransduced OP9-DL1 cells. These data suggest that MHC expression by OP9-DL1 cells is not involved in terminal maturation. It is likely therefore that MHC class I expression on human T cell precursors is responsible for the selection of CD8 SP T cells. Expression of human MHC class I and II could be detected during culture: all human CD45+ cells expressed HLA class I (data not shown) and a population of CD7−HLA-DR+CD4+CD1+ dendritic cells (DC) that expressed high levels of HLA class II Ags were present in our cultures (Fig. 3⇓, F and G). MHC expression in OP9-DL1 cultures. OP9-DL1 cells transduced with human HLA-A1 or HLA-A2 along with human β2-microglobulin were cultured with and without the addition of murine IFN-γ. 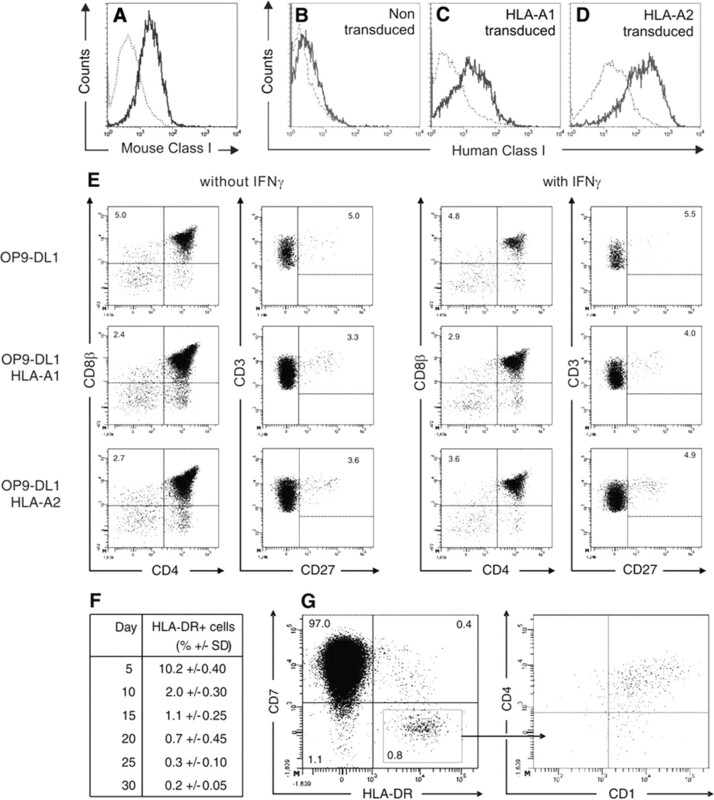 After 3 days of culture, OP9-DL1 cells were analyzed for the expression of murine MHC class I (A) and for the expression of human MHC class I on non-MHC-transduced OP9-DL1 cells (B), on HLA-A1 and β2-microglobulin-transduced OP9-DL1 cells (C), and on HLA-A2 and β2-microglobulin-transduced OP9-DL1 cells (D). The dotted line in each histogram represents MHC expression in cultures without murine IFN-γ and the solid line represents MHC expression in cultures with added IFN-γ. Data presented in A–D are representative of three experiments. E, Cocultures of CD34+ PNT cells and OP9-DL1, OP9-DL1 HLA-A1-transduced, and OP9-DL1 HLA-A2-transduced OP9-DL1 cells, with or without the addition of murine IFN-γ were analyzed at day 32 for the expression of CD8β, CD4, CD27, CD3, and TCRαβ. Cells were gated for CD3+TCRαβ+ cells. Numbers shown are percentages of corresponding populations. Data shown are representative of three independent experiments. F, HLA-DR expression at different time points of OP9-DL1 coculture was measured by flow cytometry. Numbers shown are mean values ± SD of three independent experiments. G, Expression of HLA-DR and CD7 (left) and CD4 vs CD1 expression for gated cells (right) is shown. Data were obtained from a day 15 coculture and are representative of three independent experiments. Because we found a CD7− non-T lineage population in our cultures that expressed high levels of HLA class I (data not shown) and HLA class II (Fig. 3⇑, F and G), we investigated whether these cells were responsible for positive selection of CD8 SP and CD4 SP TCRαβ+ cells in OP9-DL1 cocultures. PNT T lineage-committed CD34− CD4ISP precursor cells that are unable to differentiate into DC, and as positive control PNT CD34+ cells, were cultured on OP9-DL1 cells (1). As expected, CD34+ cells still generated CD7−HLA-DR+ cells including CD4+CD1+ DC, whereas CD4ISP cells did not generate CD7−HLA-DR+ cells (Fig. 4⇓A). However, both conditions generated mature CD27+ CD8 SP and CD4 SP TCRαβ+ cells (Fig. 4⇓B), demonstrating that DC are not absolutely required for positive selection. To assess whether cultures containing DC generated T cells more efficiently, PNT CD4ISP were cocultured on OP9-DL1 cells in the presence or absence of DC-generating CD34+ precursors from a HLA-A2-mismatched donor and the progeny of CD4ISP was analyzed (supplemental Fig. S4). HLA-A2 was used to discriminate between the cells originating from the HLA-A2+ CD4ISP cells and the cells originating from the HLA-A2−CD34+ cells. It was found that in both culture conditions mature CD4 and CD8 SP T cells were formed and that DC-depleted cultures were only slightly less efficient (CD8: 20,443 vs 26,609; CD4: 2,959 vs 6,129). Influence of DC in OP9-DL1 cultures. PNT CD4ISP and PNT CD34+ cells from the same donor were cocultured separately with OP9-DL1 cells in the presence of stem cell factor, Flt3L, and IL-7. Every 4–6 days cells were harvested and analyzed for the expression of CD1, CD4, CD7, HLA-DR, CD3, TCRαβ, CD27, and CD8α. A, CD7 vs HLA-DR staining is shown for total cells and CD4 vs CD1 staining is shown for CD7−HLA-DR+ cells on day 6 of coculture of PNT CD34+ and PNT CD4ISP cells. Numbers indicate percentages of cells in each quadrant. B, On day 34 of coculture, both CD27− and CD27+ cell populations of TCRαβ+ cells were analyzed for CD8α vs CD4 expression. In the CD8α vs CD4 plots, the percentage of cells in each quadrant is indicated. Data are representative of three experiments. A straightforward functional difference between TCRγδ cells and conventional TCRαβ cells is their responsiveness to IL-15. TCRγδ cells express the IL2Rβ (CD122) receptor constitutively, whereas TCRαβ cells express the receptor only after antigenic stimulation (3). Since the human CD122 Ab is very weak and unable to detect low levels of IL2Rβ expression, we tested IL2Rβ responsiveness by adding IL-15 or high-dose IL-2 to day 35 OP9-DL1 cocultures containing mature CD1− cells and subsequent analysis for cell growth. As control cytokines, common γ-chain dependent cytokines IL-4, IL-7, IL-9, and IL-21 were added. As expected, CD1− TCRγδ cells decreased in cell number when only IL-7 was provided, but expanded readily when IL-15 was provided (Fig. 5⇓A). A similar response was observed with high doses of IL-2. IL-4, IL-9 (data not shown), and IL-21 could at best prevent cell death but did not result in expansion. TCRαβ cells initially decreased in cell number in the presence of IL-15 or IL-2, as expected, but after 4 days these cells increased in cell number (Fig. 5⇓B). Since these kinetics suggest that only a subpopulation of CD1− TCRαβ cells is IL-15 responsive, we performed a phenotypical analysis on the IL-15- supplemented OP9-DL1 cultures. It is shown in Fig. 5⇓C that CD8αα TCRαβ and TCRγδ cells accumulated, whereas CD8β- expressing cells gradually disappeared. These data suggest that CD8αα TCRαβ and TCRγδ cells proliferate to IL-15 without prior TCR stimulation. Alternatively, IL-15 may induce expression of CD8α and suppress expression of CD8β. To discriminate between these two possibilities, CD8αβ+CD1−TCRαβ+, CD8αα+CD1−TCRαβ+, and CD8αα+CD1−TCRγδ+ were sorted to homogeneity and subsequently cultured in the presence of IL-15. Proliferation of the cells was measured (Fig. 5⇓D) and we found that the phenotype of the sorted populations was stable during IL-15 culture (data not shown). TCRγδ+ cells were the most IL-15 responsive, as expected. Of the TCRαβ+ cells, CD8αα+ proliferated much more vigorously than CD8αβ+ cells, indicating that IL-15 induces selective outgrowth of TCRαβ+CD8αα+ cells without influencing CD8β expression. Finally, RT-PCR analysis for expression of IL-2Rβ on the sorted populations showed a clear-cut correlation with IL-15 responsiveness: highest expression of IL-2Rβ on TCRγδ and CD8αα TCRαβ+ and lowest expression on CD8αβ TCRαβ+ and as negative control, CD1− CD4 SP cells and CD1+ immature cells (Fig. 5⇓E). We can conclude from these data that the CD8 TCRαβ cells generated in OP9-DL1 cultures consists out of two mature functional populations: a CD8αα+ IL-15 responsive and a CD8αβ+ IL-15 unresponsive T cell population. Responsiveness of mature T cells to IL-15. CD34+ PNT were cocultured with OP9-DL1 cells in the presence of stem cell factor, Flt3L, and IL-7. On day 35 of coculture, cells were harvested and cultured on OP9-DL1 cells in the presence of 5 ng/ml IL-7, IL-15, IL-2, or IL-21 only. At day 0 and after 4 and 9 days, cultures were analyzed by flow cytometry and the total cell number of the populations of interest were calculated. A, CD3+TCRγδ+CD1− and B, CD3+TCRαβ+CD1− cells were quantified. Mean values ± SD are shown of duplicate simultaneous cultures and are representative of three independent experiments. C, CD8β/CD4 and CD8α/CD8β profiles are shown at day 0 and after 9 and 22 days of culture with IL-15 only for CD3+TCRγδ+CD1− (upper two rows) and CD3+TCRαβ+CD1− (lower two rows) cells. Numbers in the quadrants of CD8β vs CD4 plots indicate percentages of corresponding populations and numbers shown in CD8α vs CD8β plots indicate percentages of gated cells. Data are representative of two experiments. D, On day 37 of coculture, CD3+TCRαβ+CD1−CD8α+CD8β−, CD3+TCRαβ+CD1−CD8α+CD8β+, and CD3+TCRγδ+CD1−CD8α+CD8β− cells were sorted and subsequently cultured on OP9-DL1 cells in the presence of 5 ng/ml IL-15 only, and proliferation was measured on days 1, 6, 8, and 12 of culture. Mean values and SD of duplicate simultaneous cultures are shown. Data are representative of three independent experiments. Sorts were >99% pure. E, Quantitative real-time RT-PCR analysis is shown for the expression of IL-2Rβ in CD3+TCRαβ+CD1−CD4+, CD3+TCRαβ+CD1−CD8α+CD8β−, CD3+TCRαβ+CD1−CD8α+CD8β+, CD3+TCRγδ+CD1−, and total CD1+ cells sorted from OP9-DL1 coculture on day 37. Expression was normalized to GAPDH expression and shown relative to mean transcript levels of CD8αβ+ cells isolated from OP9-DL1 cocultures. Mean values and SD are calculated from duplicate wells of the same sample. Results shown are representative of one set of samples of three. Sorts were >99% pure. An important property of functional T cells is their ability to proliferate in response to antigenic or TCR stimulation. To test for this property, OP9-DL1 cocultures were stimulated with mitogens in the presence of feeder cells and outgrowth of T cells was monitored by FACS analysis. Expansion of CD4+ and CD8+TCRαβ+ and TCRγδ+ cells was consistently observed from cultures containing CD27+ cells (between days 30 and 45) but not from early cultures which were negative for CD27 (days 10–15), indicating that these T cells were generated during culture and were not derived from a few mature T cells contaminating the CD34+ starting population (data not shown). In addition, CD8αα, CD8αβ, and CD4 SP CD1−TCRαβ+ (and TCRγδ+ cells; data not shown) mature T cells were sorted to homogeneity (Fig. 6⇓A) from day 37 cocultures and expanded. Stable T cell lines with the same phenotype were established (Fig. 6⇓B). This demonstrates that the T cells obtained after expansion were generated from mature SP CD1− T cells present in OP9-DL1 cocultures. CD4 SP TCRαβ+ cells again tested negative for Vα24 and αGalCer CD1d tetramers (data not shown). Finally, DNA fingerprinting based on polymorphism of short tandem repeats proved that the cell lines obtained in this way were derived from the original donor and not from added radioresistant feeder cells (data not shown). Responsiveness of mature T cells to TCR stimulation. CD34+ PNT cells were cocultured with OP9-DL1 cells and growth factors. On day 37 of coculture, cells were harvested and sorted for CD3+TCRαβ+CD1−CD4+, CD3+TCRαβ+CD1−CD8α+CD8β+, and CD3+TCRαβ+CD1−CD8α+CD8β− cells and stimulated with PHA and IL-2 in the presence of feeder cells (irradiated PBMC and JY cells). After 2 wk of stimulation, cells were analyzed phenotypically. A, Plots are gated on CD3+TCRαβ+CD1− cells and show sorting strategy. B, Plots are gated on CD3+TCRαβ+CD1− cells and show the outgrowth of sorted CD3+TCRαβ+CD1−CD4+ (upper two plots), CD3+TCRαβ+CD1−CD8α+CD8β+ (middle two plots) and CD3+TCRαβ+CD1−CD8α+CD8β− cells (lower two plots), respectively. Data shown are from one representative experiment of three. C, Quantitative real-time RT-PCR analysis is shown for the expression of ThPOK, CD40L, perforin, granzyme K, RUNX3, and Eomes in CD3+TCRαβ+CD1−CD4+, CD3+TCRαβ+CD1−CD8α+CD8β+, and CD3+TCRαβ+CD1−CD8α+CD8β− sorted fractions at day 37 of OP9-DL1 coculture. For these experiments, expression was normalized to GAPDH expression and shown relative to mean transcript levels of CD8αβ+ cells isolated from OP9-DL1 cocultures. Data shown are the mean values and SD calculated from duplicate wells of the same sample. Results shown are representative of one set of samples of three. Sorts were >99% pure. To investigate whether the CD4-CD8 lineage choice of the T cells was accompanied with the acquisition of the respective Th and T cytotoxic functional phenotypes, expression analysis was performed on RNA isolated from the mature TCRαβ+CD4+, CD8αα+, and CD8αβ+ populations that were sorted from OP9-DL1 cocultures. Fig. 6⇑C shows that CD4+ cells expressed the highest levels of both ThPOK, the master regulator of the CD4 helper phenotype, and CD40L (CD154), a typical Th membrane molecule (31, 32, 33, 34). CD8+ cells on the other hand expressed high levels of the CD8-specific transcription factors Eomes and Runx3 and of the CD8 effector molecules perforin and granzyme K (34, 35). No significant differences could be demonstrated between CD8αα+ and CD8αβ+ cells. To further investigate the maturity of the generated T cells, production of IFN-γ, IL-2, and IL-4 was analyzed. IFN-γ production upon TCR stimulation of TCRαβ and TCRγδ without prior expansion of the cells was measured. It can be seen from Fig. 7⇓A that a large percentage of TCRαβ as well as TCRγδ cells was able to produce IFN-γ upon PMA and ionomycin stimulation, indicating that the bulk of CD3+ cells, including TCRαβ+ cells, were functional. Because of modulation of TCR expression after CD3 and CD28 stimulation, it was technically impossible to measure cytokine production of TCRαβ and TCRγδ cells separately. Therefore, a more extensive analysis was performed on the feeder-expanded T cells described in Fig. 6⇑B. These cells were stimulated with CD3 and CD28 Abs (Fig. 7⇓B): all cell types scored positive for IFN-γ intracellular staining. CD4+ T cells expressed higher levels of membrane CD40L, IL-2, and IL-4, further substantiating the helper phenotype of CD4 cells. Cytokine production was also measured in supernatants by cytometric bead array (BD Biosciences) and production of IFN-γ, IL-2, and IL-4 by these cells could be confirmed (data not shown). Functional characteristics of activated mature cells generated on OP9-DL1. CD34+ PNT cells cocultured with OP9-DL1 cells in the presence of growth factors. A, After 32 days of culture, part of the cells were stimulated with PMA and ionomycin and 18 h later cells were analyzed for intracellular IFN-γ within TCRγδ+ and TCRαβ+ cell fractions. As a control, nonstimulated cells were used. Numbers shown indicate percentages of positive cells. Data are from one representative experiment of three. B, At day 37 of coculture, CD3+TCRαβ+CD1−CD4+, CD3+TCRαβ+CD1−CD8α+CD8β+, and CD3+TCRαβ+CD1−CD8α+CD8β− populations were sorted and stimulated with PHA and IL-2 in the presence of feeder cells (irradiated PBMC and JY cells). Two weeks later, cells were stimulated with CD3, CD28, and CD49d Ab. Eight hours later, cells were analyzed for membrane CD40L expression and intracellular IFN-γ, IL-4, and IL-2 presence. As a control, nonstimulated cells were used. Numbers shown indicate percentages of positive cells. Data shown are representative of one experiment of two and was done in duplicate. In conclusion, mature T cells are generated on OP9-DL1 stromal cells. These cells consist in part of TCRγδ+ cells and IL-2Rβ+ CD8αα TCRαβ cells and in part of conventional CD4 and CD8αβ SP cells. The latter cells display the phenotypic and functional characteristics of postselection TCRαβ cells and are probably selected on MHC expressed on human hematopoietic cells. We demonstrated here that OP9-DL1 cultures support terminal differentiation of T cells with full functional maturation of TCRαβ cells. This is surprising since no other suspension culture system (except for cultures using TCR-transgenic T cell precursors) was previously reported to generate mature T cells. In addition, since Notch signaling does not play a major role in positive selection, it is unlikely that DL1 is responsible for the observed terminal maturation (36). One possibility we rigorously excluded was outgrowth of mature T cells present at the start of the cultures. All of our cultures were started from source material such as PNT and umbilical cord blood that contained mature T cells before purification. It is therefore essential to exclude that contaminating T cells present at the initiation of the cultures, which could expand under the influence of added IL-7, are responsible for the presence of mature T cells. The observation that TCRαβ+ cells are CD45RA− would support such a hypothesis. However, there are strong arguments against such an explanation. First, sorted CD34+ HPC with no detectable contamination generated mature T cells. Second, in cultures in which contaminating T cells were present at the start, these T cells fell below detection limit (<1/105) on days 5 and 10 after the initiation of the cultures. At that time no de novo culture-generated T cells are yet present. Third, mature TCRαβ+ cells could not be expanded by polyclonal stimulation from early CD27− cultures (before day 15), a method which is known to be very sensitive. Finally, CD1− cells were detected some time after the detection of CD27+CD1+ cells (see Fig. 1⇑B), suggesting that the CD1− cells were generated from the CD27+CD1+ cells and not from preexisting CD1− mature T cells. Another possibility could be that OP9-DL1 cells function as cortical TEC in such cultures and mediate positive selection. We think this is unlikely since the OP9-DL1 cells we used expressed only low levels of murine class I and no class II. In addition, induction of MHC on OP9-DL1 cells by addition of murine IFN-γ or transduction of these cells with human HLA-A1 or A2 did not result in more efficient generation of CD8 SP mature cells. A third possibility is that cells are selected on DC or on the human T cell precursors themselves. It has been shown previously that DC can induce positive selection of DP cells and induce differentiation to CD4 T cells (37). However, our data are inconsistent with this mechanism, since cocultures that are started from T lineage-committed CD4ISP cells do not generate DC or any other CD7−HLA-DR+ cells but do generate mature CD8 SP and CD4 SP TCRαβ cells. Finally, T cell precursors that express HLA class I and some HLA class II may interact with DP cells and in this way cause positive selection. Although there is evidence that this process may induce positive selection of conventional T cells, it may be less efficient than cortical TEC-mediated positive selection (38, 39, 40, 41). However, one has to take into account that huge numbers of DP cells are continuously generated in OP9-DL1 cultures as demonstrated by their rapid turnover (data not shown). It is likely therefore that some of these DP cells may become positively selected and are later detected as mature T cells in these OP9-DL1 cocultures. Other suspension cultures, because of the absence of Notch stimulatory ligands, may generate too few DP cells to detect positively selected cells. Based on expression of CD69, CD27, and CD1, mature T cells seem to be generated in OP9-DL1 cocultures. In addition, cells can be expanded by CD3 stimulation and can produce cytokines upon antigenic stimulation, characteristics which are acquired by thymocytes in the human thymus along with the acquisition of CD27. The absence of CD45RA expression on mature TCRαβ was the only “maturation defect” we could observe. Even when cells were analyzed as late as day 45 of culture, no CD45RA expression could be detected excluding kinetic differences in CD45RA expression. It is unclear what the functional consequences are of this finding, since no functional differences could be demonstrated between both populations (21, 42). It is possible that associated terminal maturation events such as NKG2D expression and possibly others may have functional consequences and be responsible for altered functionality of such in vitro-generated cells. The majority of the mature cells generated were CD8 SP cells, in line with previous reports in mice (12). However, we found that this CD8 SP cell population consisted of an IL-2Rβ+ CD8αα population and a CD8αβ population. It is likely that the CD8αβ cells represent conventional MHC class I- restricted cells, possibly selected by MHC class I expressed on human hematopoietic cells. Less clear is the significance of the CD8αα cells. These cells are IL-2Rβ+, suggestive for a high- avidity positive selecting ligand. These cells may be the precursors of gut IEL. In mice, the precursors of CD8αα IEL are generated in the thymus as DN TCRαβ cells (43, 44, 45). The cells are generated from DP precursors (which express CD8αα as well as CD8αβ dimers) and are dependent on the presence of MHC class I-like molecules. It is not known whether these cells are positively selected on thymic epithelium or on thymocytes. However, if the latter is the case, this may be the reason these cells are prominent in OP9-DL1 cocultures. After leaving the thymus, these cells home to the gut and under the influence of IL-15 expand and become CD8αα positive (46). A prominent population of CD8αα TCRαβ cells was described in IL-15-transgenic animals (47). These cells were MHC class I dependent, since these were not observed in β2-microglobulin knockout mice but were detected in CD1d knockout mice. These cells could not be generated from CD8αβ TCRαβ cells, demonstrating that the cells were not CD8αα memory T cells. Furthermore, the cells expressed NK receptors but had a diverse TCR repertoire, expressed activation markers, and produced high amounts of IFN-γ but no IL-4. These cells are therefore called CD8+ NKT cells, different from the invariant CD4+ NKT cells. The cells we described here are very similar to these cells. In addition to CD8 TCRαβ cells, CD4+ TCRαβ cells were generated. Although these cells always represented a small percentage of the mature CD1− cells, the cells expanded very well and after short-term culture with mitogens CD4+ cells were readily detectable. The generation of NKT cells on OP9-DL1 cultures has been described in mice (48). For this reason and because NKT cell generation is known to be thymic epithelium independent, we analyzed whether the cells were NKT cells. Since the cells were Vα24 negative and did not react with αGalCer CD1d tetramers, it is excluded that these cells are NKT cells. Recently, generation of a CD4+TCRαβ+ natural regulatory T cell (nTreg) population from human cord blood CD34+ cells was reported on OP9-DL1 stromal cells (49). These cells were CD25+FoxP3+ and appeared as early as day 7 after the initiation of culture. Cell numbers increased dramatically by the addition of IL-2. This is surprising since on day 7 after initiation of cord blood CD34+ cultures, no CD4 CD8 DP precursor cells, the immediate precursor of nTregs, were yet generated. An alternative explanation therefore cannot be excluded: preexisting contaminating CD4+ T cells may expand under the influence of IL-2 and become activated T cells. Activated T cells have a phenotype very similar to nTregs. The CD4+ T cells we observed 30 days or more after the initiation of OP9-DL1 cultures expressed ThPOK and CD40L, indicating that the cells not only had acquired CD4 but had differentiated into genuine CD4 helper cells. This was further supported by their ability to produce cytokines such as IL-2 and IL-4 upon antigenic stimulation. Recently, CD4 cells were described in mice that expressed MHC class II on the thymocytes themselves and not on the thymic epithelium (10, 11). These cells were phenotypically CD4 SP cells but had an activated phenotype, expressed IL-2Rβ, and produced IL-4 and IFN-γ without priming. The cells we generated were clearly IL-2Rβ negative, suggesting that the generation of these cells is different. In conclusion, we have shown here that functional conventional and unconventional T cells are generated on OP9-DL1. The cells not only have a mature phenotype, but also display matching function. This suggests that generation of these cells may be dependent on positive selection mechanisms similar to those operative in the thymus. A prominent IL-15- responsive CD8αα population was generated in these cultures, which may be the in vitro equivalent of IL-15-dependent NKT cells. We are indebted to Christiaan De Boever for perfoming art work. We also thank Dr. I. Vanhaute (Red Cross Flanders, Oost-Vlaanderen, Belgium), Dr. K. Francois, and Dr. G. Van Nooten (UZ Ghent, Belgium) for providing human blood samples, and Dr. Tom Boterberg for the irradiation procedures. ↵1 This work was supported by Grant G.0096.05 of the Fund for Scientific Research, Flanders (Fonds voor Wetenschappelijk Onderzoek Vlaanderen), Stichting tegen Kanker, and the Interuniversity Attraction Poles Program supported by the Belgian Science Policy. S.V.C. is supported by the Instituut voor de Aanmoediging van Innovatie door Wetenschap en Technologie in Vlaanderen. F.T., T.T., and T.K. are supported by the Fund for Scientific Research, Flanders (FWO Vlaanderen). I.V. is supported by the Interuniversity Attraction Poles Program. ↵3 Abbreviations used in this paper: HPC, hematopoietic precursor cell; CD4ISP, CD4 immature single positive; DL1, delta-like ligand 1; DN, double negative; DP, double positive; IEL, intraepithelial lymphocyte; MAIT, mucosal-associated invariant T; PNT, postnatal thymus; SP, single positive; TEC, thymic epithelial cell; NGFR, nerve growth factor receptor; αGalCer, α-galactosidase ceramide; Fw, forward; rev, reverse; DC, dendritic cell; nTreg, natural regulatory T cell. Spits, H.. 2002. Development of αβ T cells in the human thymus. Nat. Rev. Immunol. 2: 760-772. Blom, B., H. Spits. 2006. Development of human lymphoid cells. Annu. Rev. Immunol. 24: 287-320. Offner, F., K. Van Beneden, V. Debacker, D. Vanhecke, B. Vandekerckhove, J. Plum, G. Leclercq. 1997. Phenotypic and functional maturation of TCR γδ cells in the human thymus. J. Immunol. 158: 4634-4641. Xiong, N., D. H. Raulet. 2007. Development and selection of γδ T cells. Immunol. Rev. 215: 15-31. MacDonald, H. R.. 2002. Development and selection of NKT cells. Curr. Opin. Immunol. 14: 250-254. Maloy, K. J., A. M. Mowat, R. Zamoyska, I. N. Crispe. 1991. Phenotypic heterogeneity of intraepithelial T lymphocytes from mouse small intestine. Immunology 72: 555-562. Treiner, E., L. Duban, S. Bahram, M. Radosavljevic, V. Wanner, F. Tilloy, P. Affaticati, S. Gilfillan, O. Lantz. 2003. Selection of evolutionarily conserved mucosal-associated invariant T cells by MR1. Nature 422: 164-169. Veillette, A., Z. Dong, S. Latour. 2007. Consequence of the SLAM-SAP signaling pathway in innate-like and conventional lymphocytes. Immunity 27: 698-710. Choi, E. Y., K. C. Jung, H. J. Park, D. H. Chung, J. S. Song, S. D. Yang, E. Simpson, S. H. Park. 2005. 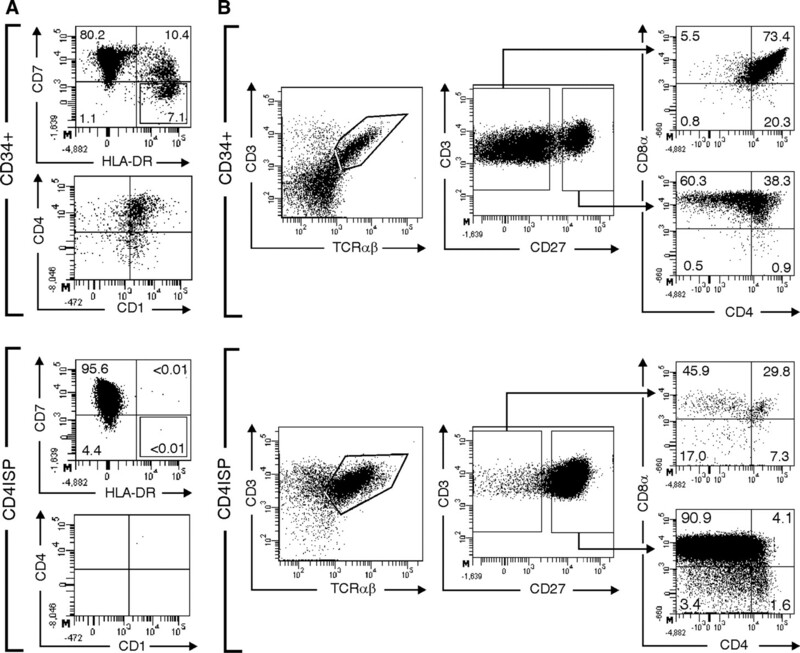 Thymocyte-thymocyte interaction for efficient positive selection and maturation of CD4 T cells. Immunity 23: 387-396. Li, W., M. H. Sofi, S. Rietdijk, N. Wang, C. Terhorst, C. H. Chang. 2007. The SLAM-associated protein signaling pathway is required for development of CD4+ T cells selected by homotypic thymocyte interaction. Immunity 27: 763-774. Schmitt, T. M., J. C. Zuniga-Pflucker. 2002. Induction of T cell development from hematopoietic progenitor cells by delta-like-1 in vitro. Immunity 17: 749-756. De Smedt, M., I. Hoebeke, J. Plum. 2004. Human bone marrow CD34+ progenitor cells mature to T cells on OP9-DL1 stromal cell line without thymus microenvironment. Blood Cells Mol. Dis. 33: 227-332. La Motte-Mohs, R. N., E. Herer, J. C. Zuniga-Pflucker. 2005. Induction of T-cell development from human cord blood hematopoietic stem cells by Delta-like 1 in vitro. Blood 105: 1431-1439. Zhao, Y., M. R. Parkhurst, Z. Zheng, C. J. Cohen, J. P. Riley, L. Gattinoni, N. P. Restifo, S. A. Rosenberg, R. A. Morgan. 2007. Extrathymic generation of tumor-specific T cells from genetically engineered human hematopoietic stem cells via Notch signaling. Cancer Res. 67: 2425-2429.
van Lent, A. U., M. Nagasawa, M. M. van Loenen, R. Schotte, T. N. Schumacher, M. H. Heemskerk, H. Spits, N. Legrand. 2007. Functional human antigen-specific T cells produced in vitro using retroviral T cell receptor transfer into hematopoietic progenitors. J. Immunol. 179: 4959-4968.
von Boehmer, H., J. Kirberg, B. Rocha. 1991. An unusual lineage of α/β T cells that contains autoreactive cells. J. Exp. Med. 174: 1001-1008. De Smedt, M., T. Taghon, I. Van de Walle, G. De Smet, G. Leclercq, J. Plum. 2007. Notch signaling induces cytoplasmic CD3ε expression in human differentiating NK cells. Blood 110: 2696-2703. Van de Walle, I., G. De Smet, M. De Smedt, B. Vandekerckhove, G. Leclercq, J. Plum, T. Taghon. 2008. An early decrease in Notch activation is required for human TCR-αβ lineage differentiation at the expense of TCR-γδ T cells. Blood 113: 2988-2998. Vanhecke, D., G. Leclercq, J. Plum, B. Vandekerckhove. 1995. Characterization of distinct stages during the differentiation of human CD69+CD3+ thymocytes and identification of thymic emigrants. J. Immunol. 155: 1862-1872. Vanhecke, D., B. Verhasselt, M. De Smedt, G. Leclercq, J. Plum, B. Vandekerckhove. 1997. Human thymocytes become lineage committed at an early postselection CD69+ stage, before the onset of functional maturation. J. Immunol. 159: 5973-5983. Hue, S., R. C. Monteiro, S. Berrih-Aknin, S. Caillat-Zucman. 2003. Potential role of NKG2D/MHC class I-related chain A interaction in intrathymic maturation of single-positive CD8 T cells. J. Immunol. 171: 1909-1917. Hori, T., X. Paliard, R. de Waal Malefijt, M. Ranes, H. Spits. 1991. Comparative analysis of CD8 expressed on mature CD4+CD8+ T cell clones cultured with IL-4 and that on CD8+ T cell clones: implication for functional significance of CD8β. Int. Immunol. 3: 737-741. Madakamutil, L. T., U. Christen, C. J. Lena, Y. Wang-Zhu, A. Attinger, M. Sundarrajan, W. Ellmeier, M. G. von Herrath, P. Jensen, D. R. Littman, H. Cheroutre. 2004. CD8αα-mediated survival and differentiation of CD8 memory T cell precursors. Science 304: 590-593. Cheroutre, H., F. Lambolez. 2008. Doubting the TCR coreceptor function of CD8αα. Immunity 28: 149-159. Blumberg, R. S., II. 1998. One size fits all: nonclassical MHC molecules fulfill multiple roles in epithelial cell function. Am. J. Physiol. 274: G227-G231. Vegh, Z., P. Wang, F. Vanky, E. Klein. 1993. Increased expression of MHC class I molecules on human cells after short time IFN-γ treatment. Mol. Immunol. 30: 849-854. Fromm, S. V., R. Ehrlich. 2001. IFN-γ affects both the stability and the intracellular transport of class I MHC complexes. J. Interferon Cytokine Res. 21: 199-208. Kalina, U., L. Ozmen, K. Di Padova, R. Gentz, G. Garotta. 1993. The human γ interferon receptor accessory factor encoded by chromosome 21 transduces the signal for the induction of 2′,5′-oligoadenylate-synthetase, resistance to virus cytopathic effect, and major histocompatibility complex class I antigens. J. Virol. 67: 1702-1706. Wildt, K. F., G. Sun, B. Grueter, M. Fischer, M. Zamisch, M. Ehlers, R. Bosselut. 2007. The transcription factor Zbtb7b promotes CD4 expression by antagonizing Runx-mediated activation of the CD4 silencer. J. Immunol. 179: 4405-4414. Liu, X., B. J. Taylor, G. Sun, R. Bosselut. 2005. Analyzing expression of perforin, Runx3, and Thpok genes during positive selection reveals activation of CD8-differentiation programs by MHC II-signaled thymocytes. J. Immunol. 175: 4465-4474. Egawa, T., D. R. Littman. 2008. ThPOK acts late in specification of the helper T cell lineage and suppresses Runx-mediated commitment to the cytotoxic T cell lineage. Nat. Immunol. 9: 1131-1139. Dik, W. A., K. Pike-Overzet, F. Weerkamp, D. de Ridder, E. F. de Haas, M. R. Baert, P. van der Spek, E. E. Koster, M. J. Reinders, J. J. van Dongen, et al 2005. New insights on human T cell development by quantitative T cell receptor gene rearrangement studies and gene expression profiling. J. Exp. Med. 201: 1715-1723. Pearce, E. L., A. C. Mullen, G. A. Martins, C. M. Krawczyk, A. S. Hutchins, V. P. Zediak, M. Banica, C. B. DiCioccio, D. A. Gross, C. A. Mao, et al 2003. Control of effector CD8+ T cell function by the transcription factor Eomesodermin. Science 302: 1041-1043. Huang, Y. H., D. Li, A. Winoto, E. A. Robey. 2004. Distinct transcriptional programs in thymocytes responding to T cell receptor, Notch, and positive selection signals. Proc. Natl. Acad. Sci. USA 101: 4936-4941. Cannarile, M. A., N. Decanis, J. P. van Meerwijk, T. Brocker. 2004. The role of dendritic cells in selection of classical and nonclassical CD8+ T cells in vivo. J. Immunol. 173: 4799-4805. Grusby, M. J., R. S. Johnson, V. E. Papaioannou, L. H. Glimcher. 1991. 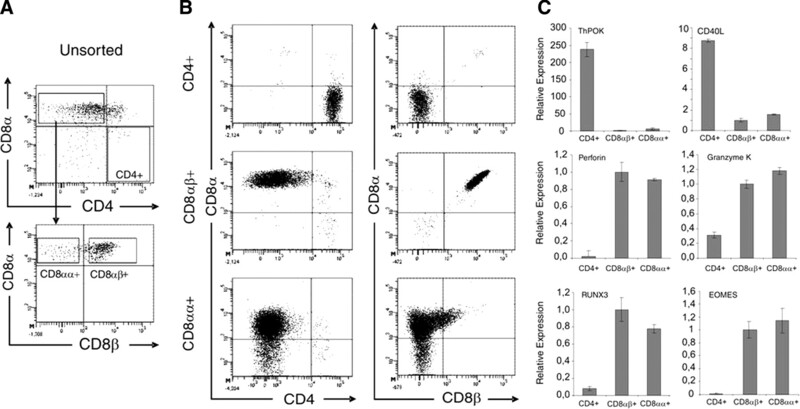 Depletion of CD4+ T cells in major histocompatibility complex class II-deficient mice. Science 253: 1417-1420. Zijlstra, M., M. Bix, N. E. Simister, J. M. Loring, D. H. Raulet, R. Jaenisch. 1990. β2-microglobulin deficient mice lack CD4−8+ cytolytic T cells. Nature 344: 742-746. Zinkernagel, R. M., A. Althage. 1999. On the role of thymic epithelium vs. bone marrow-derived cells in repertoire selection of T cells. Proc. Natl. Acad. Sci. USA 96: 8092-8097. Martinic, M. M., T. Rulicke, A. Althage, B. Odermatt, M. Hochli, A. Lamarre, T. Dumrese, D. E. Speiser, D. Kyburz, H. Hengartner, R. M. Zinkernagel. 2003. Efficient T cell repertoire selection in tetraparental chimeric mice independent of thymic epithelial MHC. Proc. Natl. Acad. Sci. USA 100: 1861-1866. Haines, C. J., T. D. Giffon, L. S. Lu, X. Lu, M. Tessier-Lavigne, D. T. Ross, D. B. Lewis. 2009. Human CD4+ T cell recent thymic emigrants are identified by protein tyrosine kinase 7 and have reduced immune function. J. Exp. Med. 206: 275-285. Gangadharan, D., F. Lambolez, A. Attinger, Y. Wang-Zhu, B. A. Sullivan, H. Cheroutre. 2006. Identification of pre- and postselection TCRαβ+ intraepithelial lymphocyte precursors in the thymus. Immunity 25: 631-641. Lambolez, F., M. Kronenberg, H. Cheroutre. 2007. Thymic differentiation of TCRαβ+ CD8αα+ IELs. Immunol. Rev. 215: 178-188. Cheroutre, H., F. Lambolez. 2008. The thymus chapter in the life of gut-specific intra epithelial lymphocytes. Curr. Opin. Immunol. 20: 185-191. Kunisawa, J., I. Takahashi, H. Kiyono. 2007. Intraepithelial lymphocytes: their shared and divergent immunological behaviors in the small and large intestine. Immunol. Rev. 215: 136-153. Terabe, M., Y. Tagaya, Q. Zhu, L. Granger, M. Roederer, T. A. Waldmann, J. A. Berzofsky. 2008. IL-15 expands unconventional CD8ααNK1.1+ T cells but not Vα14Jα8+ NKT cells. J. Immunol. 180: 7276-7286. Nunez-Cruz, S., W. C. Yeo, J. Rothman, P. Ojha, H. Bassiri, M. Juntilla, D. Davidson, A. Veillette, G. A. Koretzky, K. E. Nichols. 2008. Differential requirement for the SAP-Fyn interaction during NK T cell development and function. J. Immunol. 181: 2311-2320. Hutton, J. F., T. Gargett, T. J. Sadlon, S. Bresatz, C. Y. Brown, H. Zola, M. F. Shannon, R. J. D'Andrea, S. C. Barry. 2008. Development of CD4+CD25+FoxP3+ regulatory T cells from cord blood hematopoietic progenitor cells. J. Leukocyte Biol. 85: 445-451.